There’s a eclipse on February 15, 2018! Unfortunately, it’s only a partial, and it’s best viewed from Antarctica. But if you looking for an excuse to finish off the Valentine’s wine, you can raise a glass to the Sun the next afternoon. Or pull out your photo album and review those pictures from last August. Now THAT was an eclipse! So here it is, a couple days before the eclipse, and there are no eclipse glasses to be found anywhere. You tried calling the nearest observatory, but there’s no one there because they’ve all gone to the Path of Totality! What will you do?? How will you watch this once-in-a-lifetime event?? Calm down. It’s ok. Just go to your kitchen and grab a paper plate and a pen or pencil. No paper plates? That’s ok, any heavy paper will do. An index card, card stock (like that birthday card you haven’t recycled yet), the subscription cards that fall out of magazines, or anything that you can hold horizontally and it doesn’t droop too much. If you have an empty but unflattened box, that’s even better, but skip down a couple steps. Once you have your piece of heavy paper and a pen or pencil, you’re ready to make a simple projector. Take the pen or pencil and poke it through the paper. To use it, go outside, hold the paper horizontally and look at its shadow on the ground. In the middle of the shadow will be an image of the Sun! It’s a bit better if the ground is smooth, but during the eclipse it won’t really matter. If you have an unflattened box and some time, grab that foil and make a cereal box viewer. While you’re at it, try some experiments: (here’s the part that totally blew my mind back when I was an undergrad) the shape of the hole doesn’t matter that much. Make square, rectangular, triangular holes. Pull out those fancy scrapbooking paper punches. The image of a light source will always be the shape of the light source as long as the hole isn’t too big! And that brings us back to the kitchen, because colanders are a whole lot of fun at eclipses! With all of these “pinhole projectors” remember, they’re projectors: look at the image on the screen (or ground)! Finally, keep some perspective. It’s not really a once-in-a-lifetime event, unless for some reason you are completely unable to travel. There are, on average, 2 solar eclipses per year, though only about half of them are total. Also, they have an annoying tendency to be visible only in really inconvenient places, like the middle of the ocean, or above the arctic circle. It might not be easy, but it IS possible. Posted by aquillam in Astronomy, Galileoscope, MichiganAstro, Urban Observing. There’s only a week left to get ready for the partial solar eclipse! Since it is only a partial, there is never a moment when it will be safe to look at the sun without proper protection. DO NOT LOOK DIRECTLY AT THE UNFILTERED SUN. Got a small ‘scope and want a way to view the sun safely with it? How about building a sun funnel! 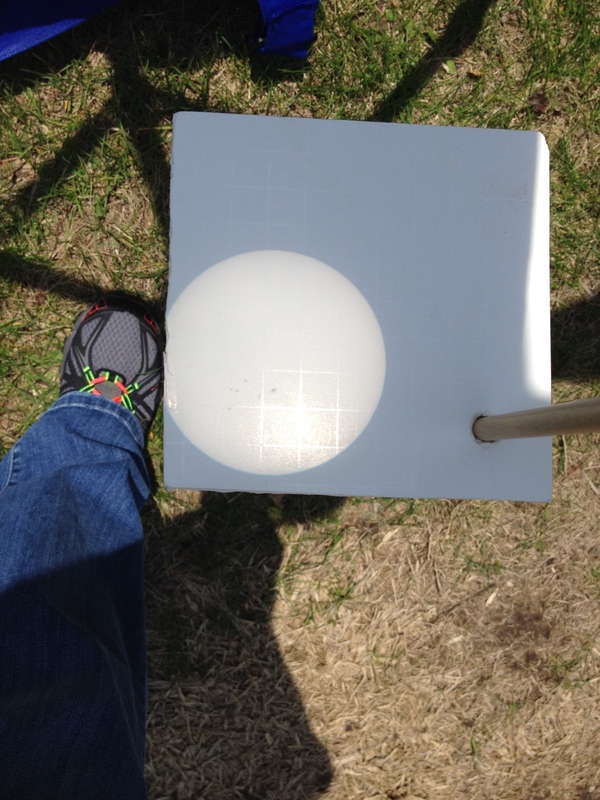 Get the directions for a sun funnel from the transit of Venus site. Don’t have the patience for that much effort? Projection screens are simpler, but you’ll have to keep an eye on your telescope to make sure nobody tries to actually look through it. In fact, I don’t recommend using this method at star parties or public events. Most non-astronomers don’t know how to tell the difference between a filtered and unfiltered telescope. Even if you make the tripod short and project onto the ground, that just makes it perfect for a curious four-year-old. However, for yourself or an older audience, this is a very quick and easy way to observe the sun. The simplest version of this this is a white piece of paper on a clipboard, held in front of the eyepiece. If you’re going to use a projection screen, make sure you have real glass eyepieces. Nothing like having eyepiece go up in smoke halfway through the eclipse. If you are using a Galileoscope, you probably shouldn’t use the eyepiece that came with it. This screen is mounted on a dowel, which is zip-tied to the telescope. I’ve still had kids try to squeeze their head in against the dowel. No telescope? You can do the projection with a pair of binoculars to. Again, keep a close eye to make sure no one actually looks through the binoculars. If you have no optics whatsoever, you can still watch the eclipse. Just poke a hole in a piece of paper and project the image onto the ground or another piece of paper. This isn’t a great way of looking for small features like sunspots, but it will certainly show off of eclipse. For that matter, so will the shadow of a leafy tree. 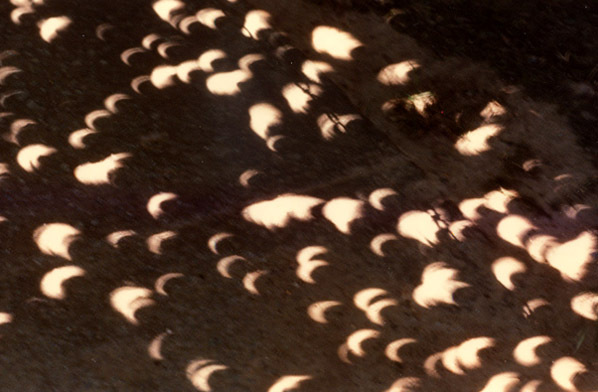 A solar eclipse viewed using leaf shadows. Click for original image and more information.